And here is another all-time favourite of mine. A raw pie that works with all kind of fruit. Any frozen berry will do, although I prefer organic strawberries or blueberries because of their small seeds. Ripe pears with ginger work well, persimmons are great, so is kiwifruit. Just make sure you add enough lime or lemon juice to counter balance the fruit sugar and the sweetness of the crust. The proper ratio for the psyllium husk powder is 1 Tbsp per 2 cups of mixture. Add last and blend well. Then quickly pour the filling. It will solidify in less than 5min. After about 30min the pie will hold up nicely when you lift it out of the pie form. If you can’t get psyllium husk powder just buy normal psyllium husks and grind them into a fine powder in your blender. It will jelly into a more homogenous texture than the whole psyllium husks. To make the crust, in a food processor grind the coconut into a fine powder. Add the cashews and continue processing till they are broken down finely. Add the honey/agave nectar and lemon juice and process till the mixture sticks together. Press into a pie form with removable bottom. To make filling blend the defrosted blueberries with the dates, vanilla extract and lime juice to a smooth liquid consistency. Add the Psyllium husk powder and blend shortly to distribute evenly throughout the mixture. Pour filling onto crust. Tap pie form a few times to let air bubbles escape and to distribute filling evenly. Smooth surface with a little spatula. Refrigerate before serving and garnish with mango or pineapple. Here is a delicious winter recipe with a surprisingly easy preparation and brilliant flavour combination. The cranberries add a lovely sweet and bitter contrast to the salad. You might have seen me demonstrating and sampling this salad at New World in Remuera, Auckland. Stay tuned, there is more good stuff to come! Combine all ingredients in a big mixing bowl and massage well by using your hands in order to soften the cabbage. Pause and let the salad rest for 5 min before massaging it to final softness. The cabbage should start to release liquid. Together with the finely distributed avocado this will make your dressing and also soften the dried cranberries. Variations: Play with other vegetables from the cabbage family! Broccoli and kale work well. You can also add carrots and beetroot. Substitute the cranberries with sultanas or dried and minced apricot. To soften cabbage and other hardy vegetables by massaging you will need natural salt. Acid and oil will help to soften the vegetables too and to distribute the flavours. Raw Sauerkraut – my German heritage at its very best! This recipe has become a staple in our kitchen and pantry. Once made the sauerkraut will last for months. That’s what it originally was made for – to preserve the cabbage harvest over the winter months. With a little bit of help from the Lactobacillus acidophilus that lives naturally on cabbage. It turns the fermenting cabbage into a pro-biotic feast. Your intestines will love you for the support of friendly bacteria. In fact sauerkraut and other fermented cabbage products (more posts to come) have been a major part of our own rejuvenative diet. Ask your naturopath or colon therapist for their opinion on friendly bacteria from sauerkraut! Massage the cabbage with the salt until the liquid starts to release. Let the cabbage rest for 10 minutes and massage it again. Repeat as often as necessary until the cabbage is very juicy. Add the remaining ingredients. Pack the mixture firmly into a large glass jar, crock, or bowl. Press the cabbage down until the liquid rises above it approximately 0.5cm. If you are using a large jar for your kraut, place a weight on top of the cabbage, such as a jar filled with water or a plastic bag filled with filtered water (see picture). Make sure to cover the jar with another plastic bag to keep any critters out. Place the jar in a bowl to catch any overflow of sauerkraut juice. collect the juice in a jar in your fridge and back to the finished kraut. 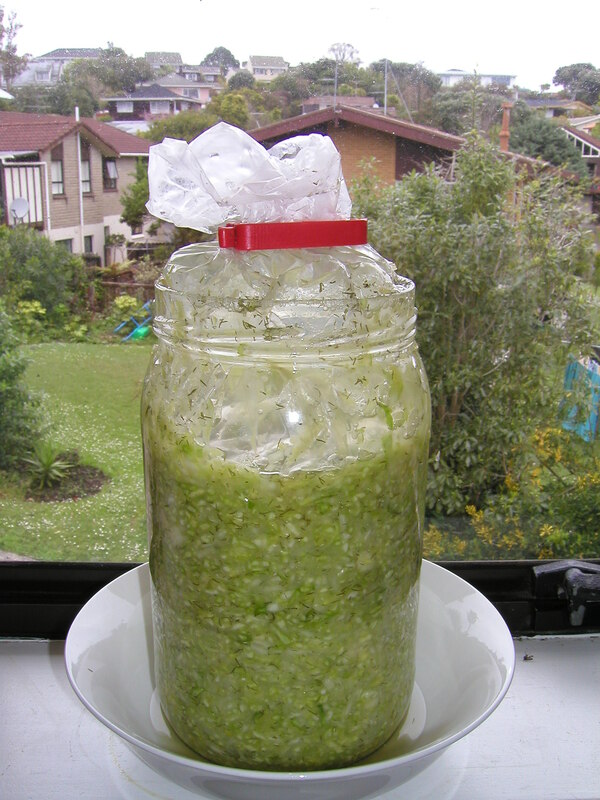 Allow the kraut to ferment in your kitchen for at least 3 days (see note). We line the jars up in the window (no direct sun though). Once the kraut is ready, store it in airtight glass jars in the refrigerator. It will keep for several months. Note: Kraut may be fermented for up to14 days, depending upon the desired degree of sourness. Have fun experimenting with Sauerkraut! You can make variations with red cabbage, kale, add grated carrots, parsnips, broccoli etc.. It still is a great way to preserve a temporary over supply of vegetables. If you plan on adding any spicy foods like garlic or chilies to your sauerkraut wait till it is properly fermented. Garlic, chilies, ginger etc. are nature’s anti-biotics and will actually delay the fermentation process by inhibiting the lactobacillus acidophilus bacteria – for a while at least. Other flavour options apart from dill are juniper berries and caraway (a spice I still hold some traumatic childhood memories of :-)). Use your clean hands to massage the kraut! Go full out! Deep tissue, not Bowen 😉 The natural bacteria on your hands will be good for the fermentation process too. Just avoid those nasty alcohol-based desinfectants. ‘Dr. Bronners’ soaps will do – for a mild peppermint flavour in your Sauerkraut – just kidding. The jar you see in the picture is a former olive or capers jar from our local deli. They hold 2 liters of anything (obviously :-)) and make great storage vessels for your pantry. We keep all of our nuts, seeds, spices, flour, crackers etc. in them. With our “Dry it, you will like it!” class coming up here a little teaser and one of my favourite raw snack recipes. Should you prefer pecans over walnuts use them! For a different twist try sunflower seeds. They have a lighter yet nutty base flavour and dry in handy clusters. See the yummy picture below! Mix everything thoroughly in a big bowl. Dehydrate at 105F for 12 hours. Turn over and remove Teflex sheet. Dehydrate for another 12 hours or until crisp. Turn trays by 90° periodically.